Vision Statement: My former home city, Georgetown in Texas, is one of the first US cities of more than 50,000 inhabitants with 100% renewable energy supply—provided by its own power municipal utility. Building on that achievement, the City sought to develop a vision statement to provide focus and strategic direction for the City’s community. Many cities and large towns in the US similarly try to encapsulate what they think will be uplifting and inspiring words both for local councillors, city administrators and the citizens seeking to improve the place where they live. I am not sure that the intention was realized, but you can be the judge of that. This is the result: “A caring community honoring our past and innovating for the future.” I have forgotten it already. The vision statement was roughly dented by the racial violence in August 2017, when one counter-protester was killed. The City Council and many community leaders are now working on ways to reinforce the vision, since on their own, statements of intent were not enough to realize the dream, nor to prevent the expression of racial hatred in the streets. I see no change to the vision statement, but the 2018-2020 strategic plan for the city now has as it’s first goal, to be “An Inclusive Community of Self-sufficient Residents”. In business, we create corporate strategy, and the vision statement that goes with it, largely from within the organization, even if we do good fieldwork and market research outside. We create vision statements that express fervent hopes for the behaviors of those whom we don’t control, and generally they don’t seek consensus with the communities around us: suppliers, customers, competitors, governments, local community—our stakeholders. On the other hand, a startup venture without any ‘pre-existing conditions’ can start from scratch to work with all their stakeholder communities to create value. Although new entrepreneurs tend to be very good at ‘getting out of the building’ and being among their stakeholders, they often create a vision statement that also simply proclaims wishful thinking, like the big boys. Indeed, vision statements are generally about aspirations (for the future), but my first mentor gave me advice which was invaluable. “Speak about your venture in the present tense right from the start,” he insisted. Using the present tense helps you live your vision and to be able to spot when you are failing to live up to it. Stakeholders will call you on it, if you don’t live the claims every day in every way. ‘Command and control’ used to be the management norm among the multinationals. Aspiring entrepreneurs often emulated the (failed) behavior of the behemoths, imagining it to be the route to success. Words like humility, frailty or fallibility formed no part of their own business lexicon. The reality of a new venture is that it can be nothing but humble, frail and fallible. To acknowledge this will draw stakeholders into working with you to build the desired consensual future through collaborative leadership. You might like to read what I have to say about Founder Compassion. Many of the vision statements with which I have been involved, so motivate the creators that they fall in love with them, entirely overlooking how dependent their achievement is, upon those over whom they exercise no control. A vision statement is about aspirations and as such, must acknowledge the realities of the things and people who can get in the way of their realization. You’ll find more help at Startup Statements of Intent. A vision statement should concede that the authoring organization needs the acquiescence, at least, or the partnership at best, of others who actions are autonomous and independent of the creator of the vision statement. Such humble vision statements without bravado, will not lead to the kind of disappointment that Charlottesville must have experienced—and are more likely to produce the desired outcomes. 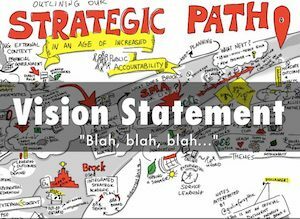 Did you read the word ‘vision statement’ in his description of strategy?